Alexander Davidson is character in the Walking Dead comic and TV series. The character is only mentioned and never shown in the comic. Who destroyed Noah's Home in Richmond? Who are the Wolves? Alexander Davidson is a character in the Walking Dead comics. He never appears but is mentioned. Alexander Davidson was the original leader of the Alexandria Safe Zone. At first he is considered a great leader, and through his guidance the walls of Alexandria were raised. However, as time goes on he begins to abuse the power he was given. He was eventually ostracized by Douglas Monroe. As a leader Alexander began abusing women and people, which forced Douglas's hand. Alexander presumably died by being ostracized. The TV version of Alexander Davidson is also based off another comic character called Derek. In the comics Derek runs a group called the Scavengers. The Scavengers are a group that seems to go around attacking and taking from other communities. They make a major mistake when they decide to attack Alexandria. The group seems to expect little resistance from the Alexandrians but instead runs into the Rick Grimes crew and particularly Andrea who is acting as a sniper. Andrea begins shooting down the Scavengers before they realize what is happening. 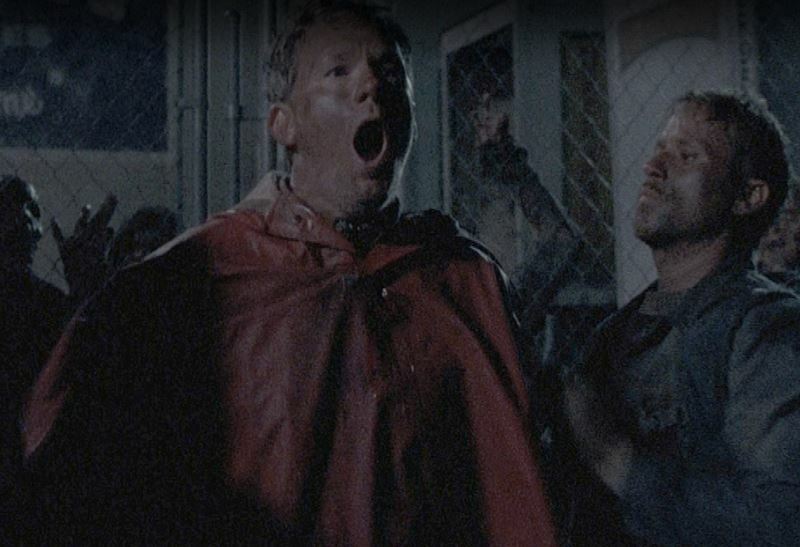 In the end, the Scavengers are badly beaten back / annihilated by the Rick Grimes crew. The event solidifies Rick as the leader of the Alexandria Safe Zone. Alexander Davidson also appears in the show though he is different.. He was the leader of a small group that was driven out of Alexandria Safe Zone. They were pushed far away from Alexandria Safe Zone. This was done by Aaron. Aaron let Davidson and his followers survive, and left them with a small amount of supplies. Davidson then creates the group known as the Wolves that begins attacking and killing other communities. This version seems to combine the Alexander Davidson character and the Derek leader of the scavengers from the comics. He believes himself to be the second coming of the old wolves that used to live in the North East. He and his partner create elaborate traps using walkers. Aaron and Daryl find themselves in one of these traps but are rescued by Morgan. The trap used semi trucks that appeared to potentially have food inside. Instead, each of the semi trucks was filled full of walkers. When one door was opened they all opened releasing an army of walkers upon who ever was attempting to scavenge the area. Aaron described Alexander as smart and strong. Apparently, he was also too evil for the community. Davidson also had a male and female as followers. In the TV show only two males were shown. Presumably, the man conversed with Morgan was Davidson. Who is Deanna / Douglas Monroe? Who is Eric from Alexandria Safe Zone? Who is Tobin from Alexandria Safe Zone? Who is Francine / Holly from Alexandria Safe Zone? Who is Jessie Anderson from Alexandria Safe Zone? Who is Pete Anderson from Alexandria Safe Zone?